Looking for a little weekend getaway? Go enjoy a leisurely vacation at Batam city or Bintan Island, which are two of the nearest Indonesia travel destinations from Singapore that you are able to reach with just a ferry ride. Majestic Fast Ferry will come to mind when you are making a choice from the various ferry operators to choose from. They offer ferry services to Batam and Bintan with their high-speed ferries that come with comfortable seats and timely schedules. Find your preferred destinations offered by Majestic Fast Ferry as well as the schedule and ferry ticket prices through Easybook. Make your online booking conveniently with us today by following this simple booking guide. 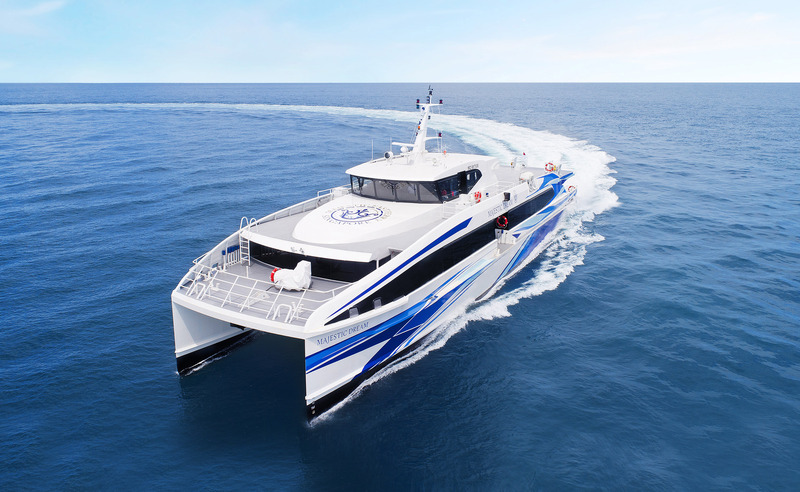 Majestic Fast Ferry is a ferry operator based in Singapore that serves passengers that travel to and fro Harbour Front and Tanah Merah Ferry Terminal in Singapore, as well as Batam Center and Sekupang Ferry Terminal in Batam and Tanjung Pinang in Bintan in Indonesia. Majestic Ferry featuring two series of high-speed ferries called Majestic and Wavemaster. The Majestic ferries come with 317 seats, while the Wavemaster series have a capacity of 168 in each vessel. They are known as the fastest, most luxurious, high tech and youngest fleet in the region. Being a responsible	ferry operator, they are committed to continuously uplift the standards of their services to ensure each passenger’s safety is the main priority. This is also to make sure their passengers have a pleasant and enjoyable journey with Majestic Ferry. Majestic Fast Ferry’s daily trips from Harbour Front Singapore Ferry Terminal to Batam Center Terminal depart as early as 8.10 AM on Singapore Time and the last trip is at 9:20 PM. From Batam Center Terminal to Harbour Front Ferry Terminal, Majestic Ferry trips start at 6:00 AM on Indonesian time and the last trip is at 8:35 PM. The daily trips for Singapore (Tanah Merah) to Indonesia (Batam Center) begin at 8.10 AM with 8:45 PM for the last boarding. You can find return trips as well that kicks off at 6:15 AM on Indonesian time and 6:00 PM for the last trip. Majestic Ferry also provide sea transportation services between Singapore (Harbour Front) and Indonesia (Sekupang Ferry Terminal (Batam), Singapore (Tanah Merah) and Indonesia (Tanjung Pinang Ferry Terminal, Bintan). Find out more details about the departure time via for the mentioned trips on Easybook website or download our mobile app today. The choice of places you can explore when you travel with Majestic Fast Ferry to Singapore, Batam or Bintan are endless. Start making plans for the trips with your family and friends through Easybook to book the ferry tickets of your choice with Majestic Ferry!